Do you walk, run, or bike? Do you plan to get started soon, but need a little extra motivation? Do you own a Smartphone? If you answered yes to these three questions, then you could be exercising and supporting Feeding America, the nation’s largest domestic hunger-relief charity, at the same time. All you have to do is download the free app called Charity Miles. Every mile you run, walk or bike raises money for charities of your choice. This past fall I began to see tweets from Feeding America and the UN World Food Programme about Charity Miles and combining fitness with philanthropy. My own form of exercise had been walking, and I didn’t own a cell phone, but in late September, I took the plunge. I bought a cell phone and decided to start running. For me, I choose Feeding America as my charity to support during my runs. 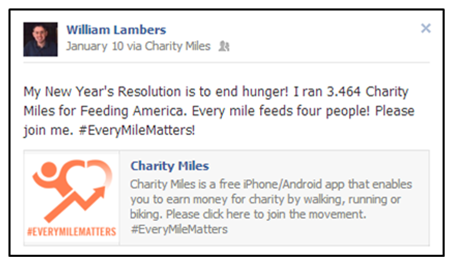 The Charity Miles app keeps track of your distance and posts the results to your Facebook page. For every mile you run or walk, 25 cents is donated to Feeding America. Biking raises 10 cents per mile. Every mile helps provide meals to people facing hunger through Feeding America. Rome was said to be built on seven hills, but here in Western Hills, OH—where I live—it seems like there are 7,000 hills! Saying it is “hilly” here is an understatement. My running paths may be tough, but my mission is always clear—every step I take, and every mile I run, I can help people struggling with food insecurity. To date, people just like me have helped Charity Miles raise more than $19,000 for Feeding America. Imagine how many meals could be raised if whole track teams starting using the Charity Miles app. Or, if every runner in this April’s Boston Marathon used Charity Miles. Strength in numbers. This is the whole idea behind Feeding America’s Together We Can Solve Hunger campaign, launching at the beginning of February. Charity Miles is one of several ways you can help end hunger. Check back in with Feeding America at the beginning of February to find out how you can participate in the Together We Can Solve Hunger campaign. It’s time to report for duty. There is enough food in the world for everyone. Let’s solve hunger—together! Visit FeedingAmerica.org and CharityMiles.org for more information.